When I was in India recently, I was fortunate to see for the first time a collection of exquisite Kani shawls, handwoven in Srinigar, Kashmir. I also met an ecceptional young Kashmiri student at the Kashmir Loom studio in Delhi. Qamoos Bukhari is his name. 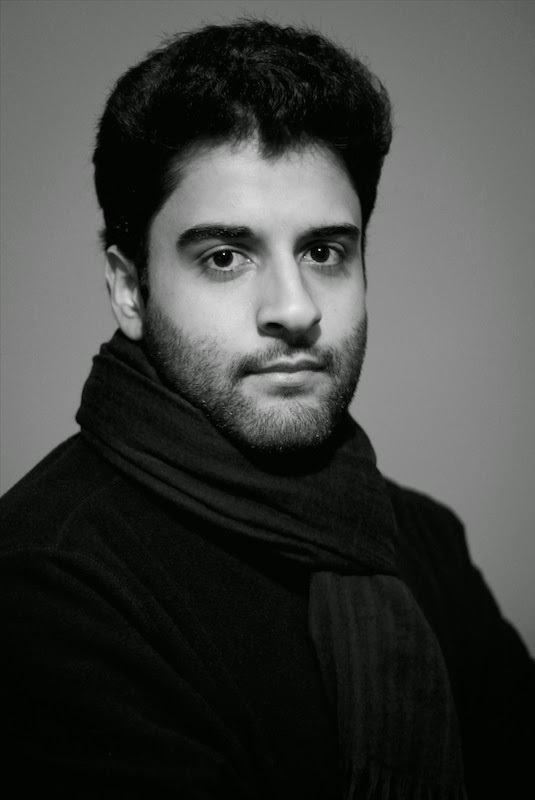 It turns out that he is a very talented and inspiring young photographer—and that he has a story to tell, of Kashmir and handcrafted cashmere shawls, and beauty and devotion. And there is more to this story. This week on THE STYLE SALONISTE, come with Qamoos and me to Srinigar, Kashmir, to see where the most beautiful cashmere handwoven shawls are crafted. And learn the tragic news. 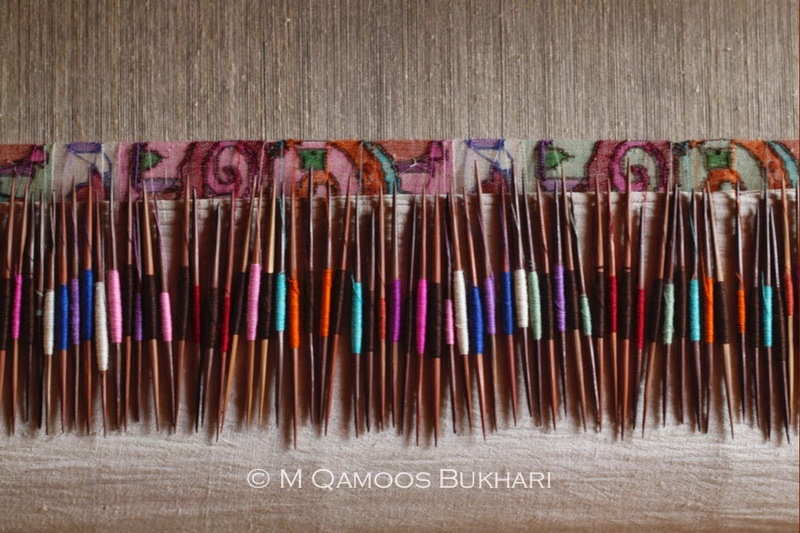 The images crafted by Qamoos, never published or shown, portray the beauty and centuries-old crafts of that region. Qamoos has a fascinating story, which he told me recently. It will be of great interest to my designer readers, and everyone who loves beauty. 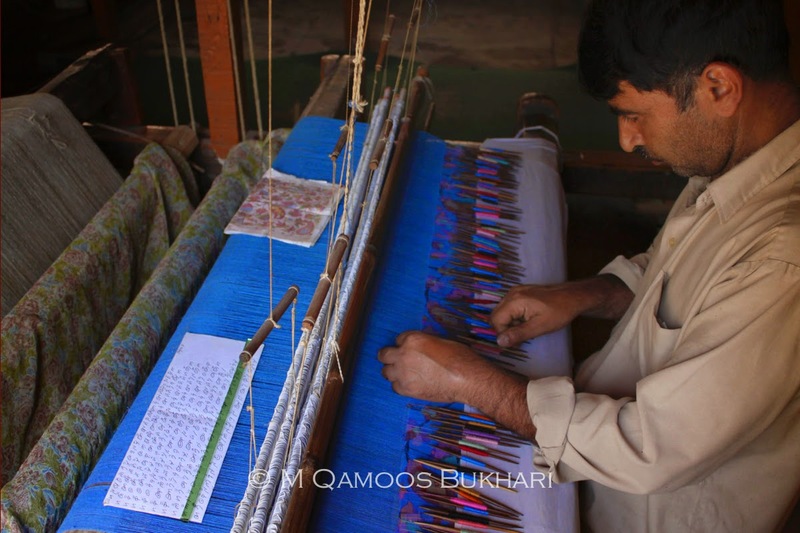 I met Qamoos Bukhari, 20, because he is working on the autobiography of Jenny Housego, the wonderful co-owner of Kashmir Loom, a twenty-year-old company that sells the most exquisite cashmere shawls. 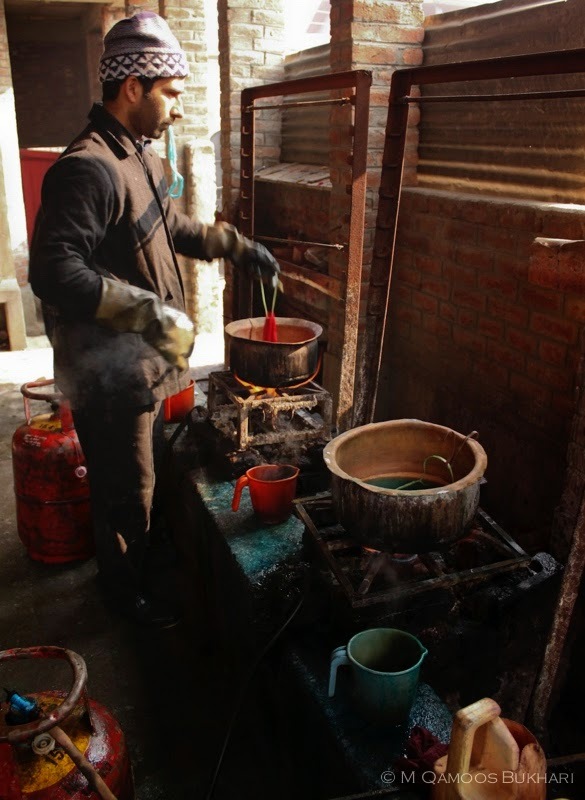 I’ve written about Jenny and Kashmir Loom in my reports on India. 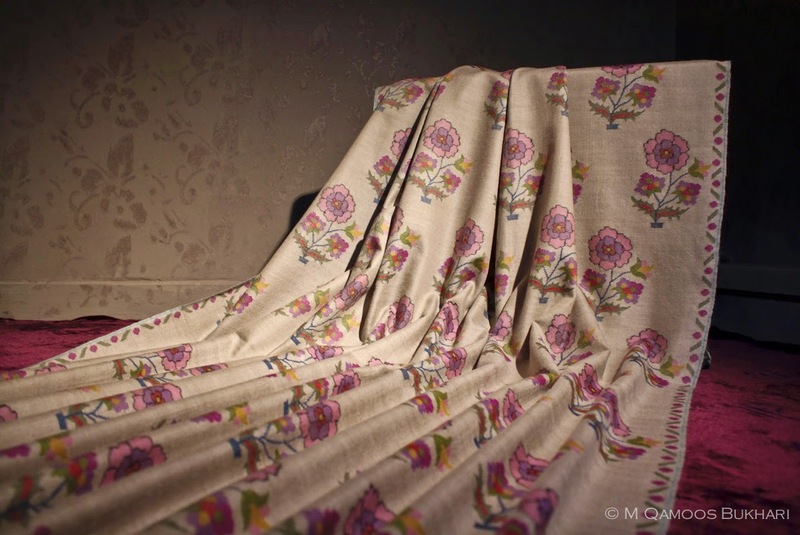 She offers the finest cashmere and pashmina shawls, authentic and hand-woven and many of them hand-embroidered in traditional patterns and with the finest silk threads and exceptional craftsmanship. Qamoos was visiting Jenny the day I stopped in to select pashmina shawls. He is studying in Delhi. 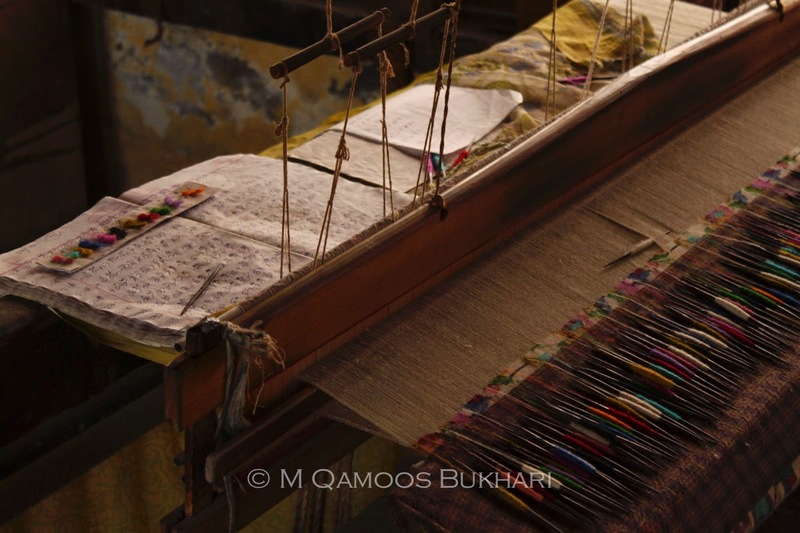 Come and find out more—and learn about rare KANI shawls, the finest, and a story of Srinigar. It is a long and compelling story. I propose that you turn on the kettle, and make a cup of Chai, traditional spicy Indian tea. Or, like me, put some loose-leaf Assam tea in the teapot, pour boiling water over it, wait for ten minutes…and sip the most delicious tea, and read this exclusive story. 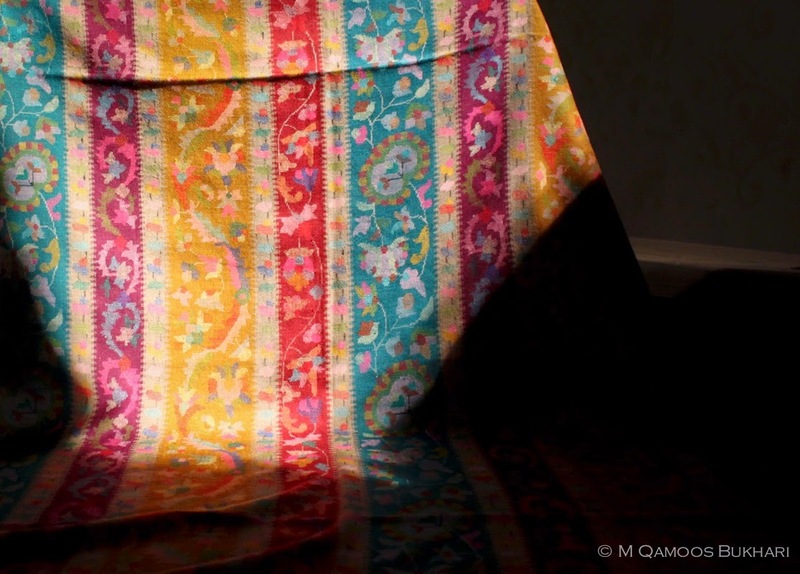 Kani shawls are rare, precious and seldom seen outside India. 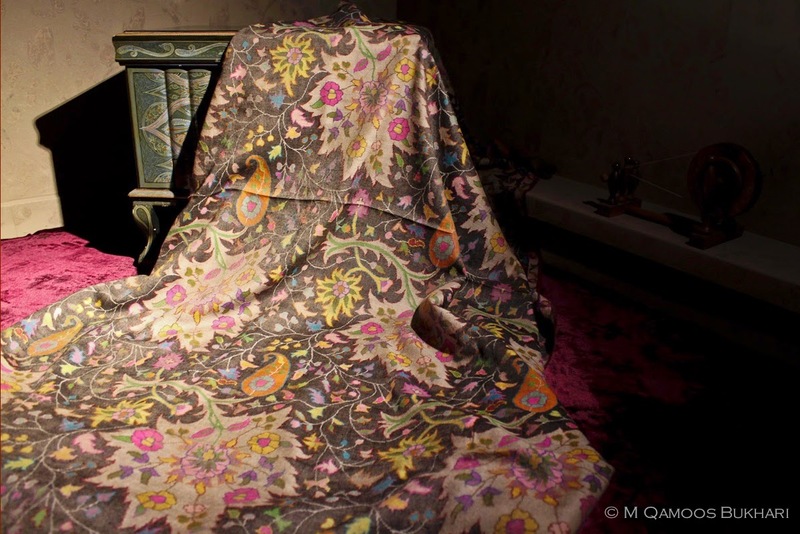 The traditional patterns are Persian motifs that crisscross the shawl in elaborate and symbolic designs. 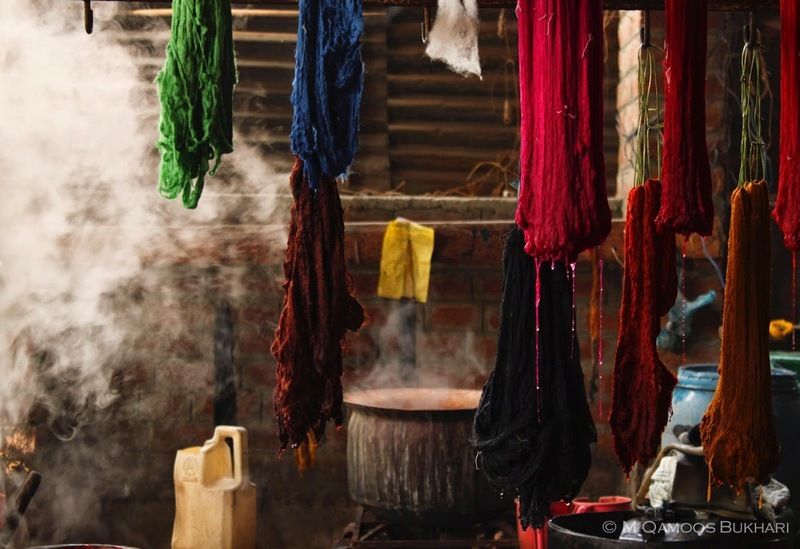 The colors are soft and harmonious, usually vegetable dyes. 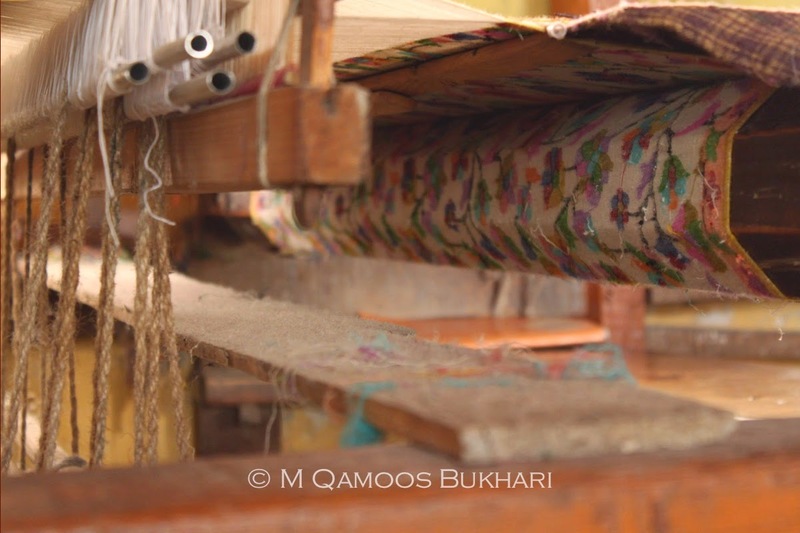 Kani shawls are made on old wooden looms, always by men. They devote their lives to crafting these luxurious and butter-soft works of art, some of which may take months or years to complete. In India they may sell for $2,000 to $3,000 and more. They are as soft as butter, with a creamy warmth and sensuality that is specific to these woven beauties. Traditionally they have striped borders. I particularly admire shawls with a black background, and love those in natural undyed cashmere/pashmina yarn that is rare and neutral and very beautiful. I don’t own one. I asked Qamoos Bukhari to tell me about this rare artistry which is now in danger of dying out. 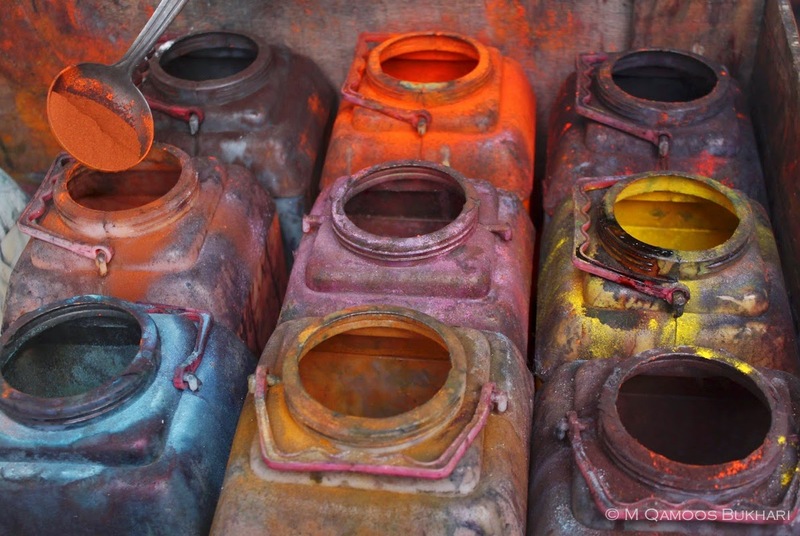 Qamoos shot all of these images as a three-year project. I appreciate that he has given permission for me to publish these images exclusively for my readers. His family arrived in Kashmir several centuries ago from Persia, along with Kani weavers, musicians, artists, embroiders, and the many craftspeople that surrounded Mughul and religious leaders. 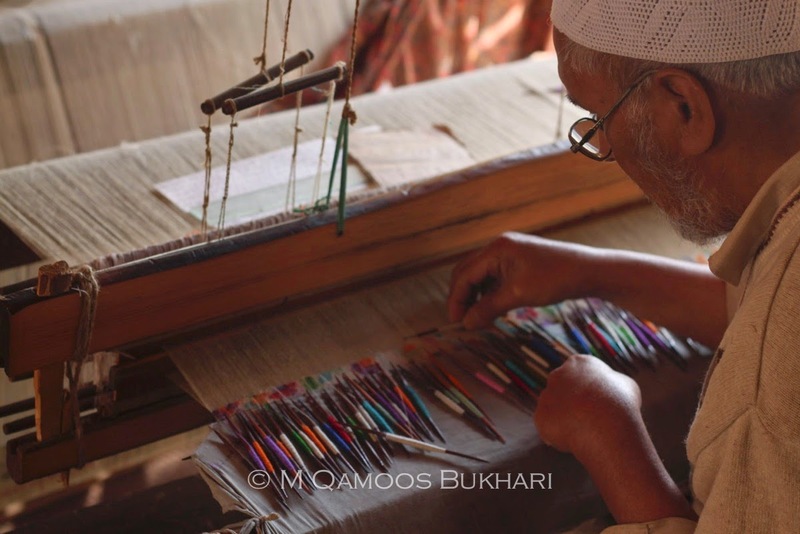 The photo of the old man on loom: He is 93 and is the oldest living weaver of Kani in Kashmir. Authentic Kani shawls are so rare; I’ve only ever seen a few in all the many years I’ve been traveling to India. They are not shatoosh shawls, which are illegal. 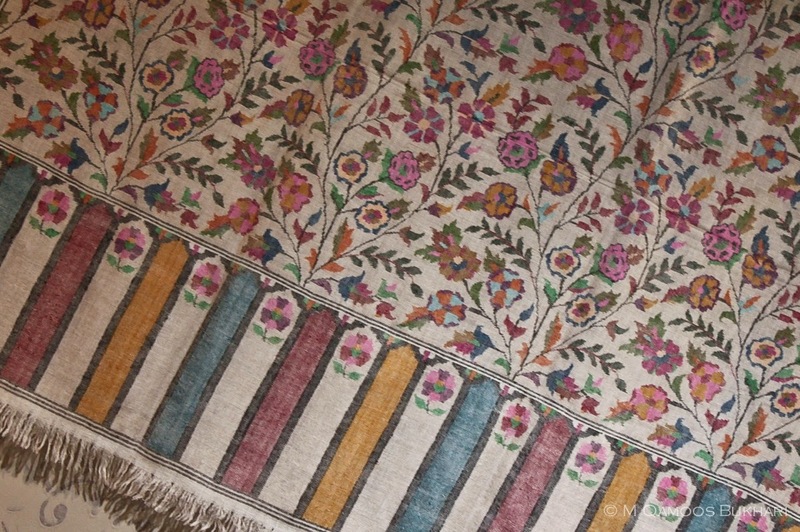 Many ‘authentic Kani shawls’ are offered online. I can see by the shiny surface and patterns that they are machine made, most of them. Now after the floods damaged looms, authentic Kani will become even more rare. 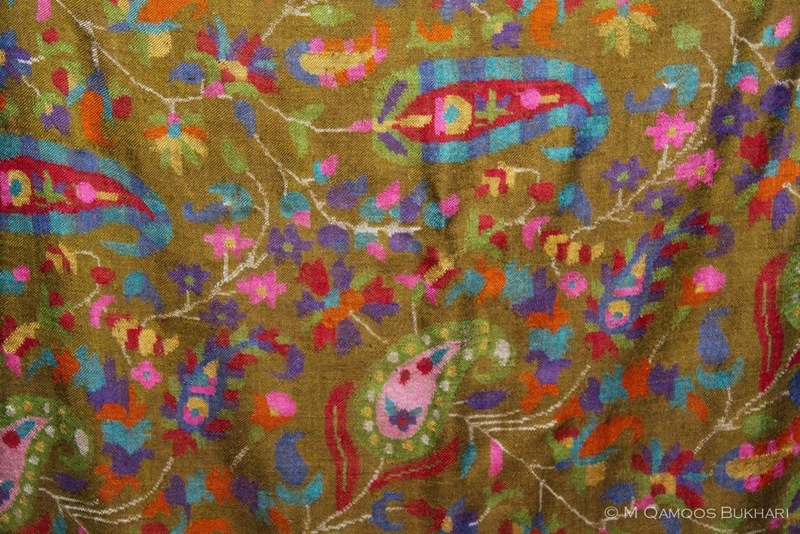 When you have seen the handcrafted surface of a real Kani (not entirely smooth and with the texture of handwork) and felt the rare and thrilling whipped cream softness of a Kani shawl, and seen the subtle and sometimes floral-bright colors, you can instantly discern a factory-made simulation. How to find a Kani: It is not advised to travel to Srinigar at the moment, but contact Kashmir Loom in New Delhi, which occasionally (seldom) has a small collection. Contact Jenny Housego at www.kashmirloom.com. I am 20 years old. I was born in Srinagar but have spent most of time in various different parts of India, mainly because of my father’s profession as a cinematographer. I have grown watching cameras and things around me, talks, teachings on arts and aesthetics through which my father made me familiar with the surroundings. In a way I am attached to camera in a sense, my each and every moment is captured by it. Ideologically I think my life is witnessed by a camera. There is a big glass almirah in our house in Srinagar which has all the old and antique cameras my father possesses. It was inevitable that I would pick up a camera and record historic arts in Srinigar. I am now a student in New Delhi, but often return home to visit my loving family. 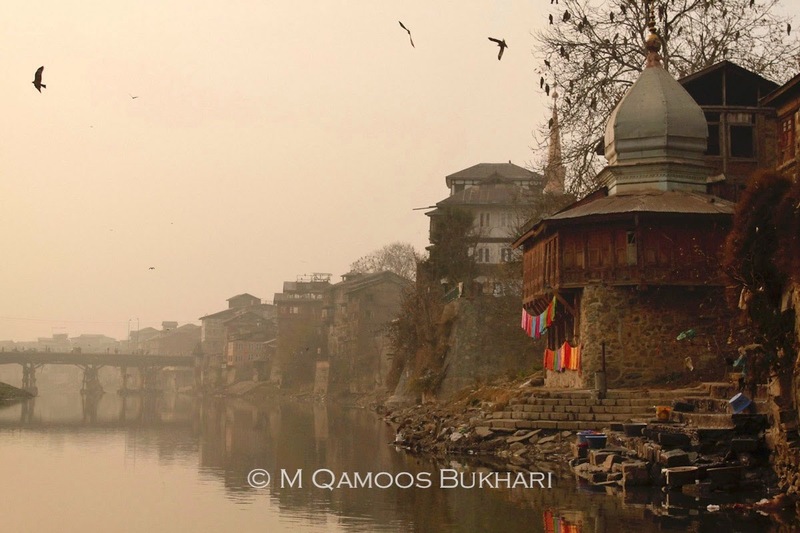 All exclusive images here were photographed by M. Qamoos Bukhari in Srinigar, Kashmir. 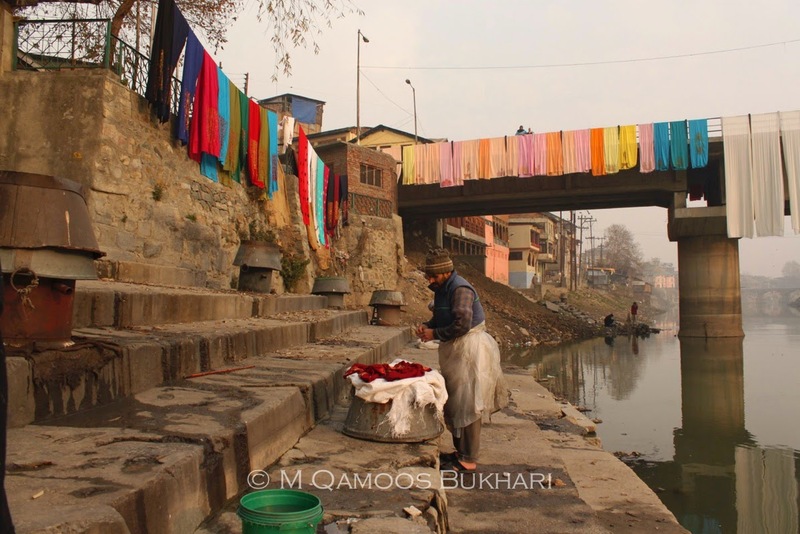 Last September 2014, the Srinigar region of Kashmir was hit by severe floods that damaged many residences, destroyed bridges and historic buildings, and wrecked many of the ancient wooden looms that craftsmen use to make pashmina, wool, silk, and Kani shawls. I have donated to UNICEF and Save the Children. Specifically. What an incredible tale of both beauty, and yes, tragedy Diane. Your travels take us to a world I know I would not know if it were not for you. Thank you. Thank you so much Diane for such a wonderfully informative and beautiful post. You are so very fortunate that you have witnessed such beauty and hence, can feel for the devastation they have gone through with the floods. I'm so happy to hear your thoughts. Those fabrics are phenomenal for lack of a better word! I have a friend who does work there for several months a year and says that it is a place that is a must to visit but because it is so beautiful people are always fighting to own it...Thank you for sharing.